Home News AP News Naidu Looking For Excuses For Defeat! Naidu Looking For Excuses For Defeat! Telugu Desam Party president and Andhra Pradesh chief minister N Chandrababu Naidu is apprehensive of his impending defeat in the forthcoming assembly elections and is therefore looking for excuses for the same. It is clearly evident from Naidu’s hue and cry over the malfunctioning of Electronic Voting Machines in the elections and his nation-wide campaign to do away with EVMs and for returning to the ballot paper method. Naidu, along with the other opposition parties at the national level including the Congress, went to the Election Commission of India on Monday to submit a memorandum on doing away with the EVMs in the coming elections. 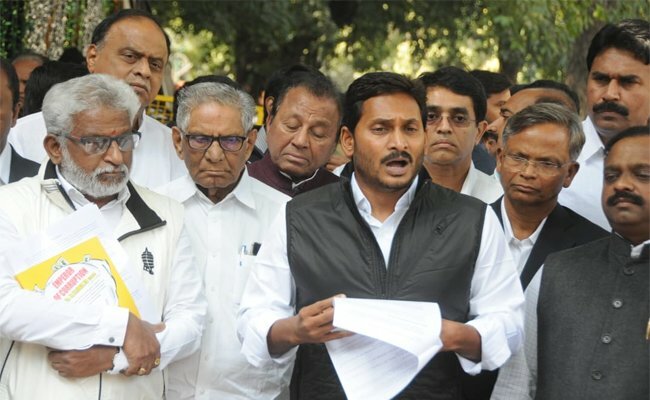 However, his arch rival and YSR Congress party president Y S Jaganmohan Reddy dismissed Naidu’s apprehensions on EVMs and defended Bharatiya Janata Party’s stand on the same. Speaking to media in New Delhi, Jagan said Nadu needs someone or something to blame for his imminent defeat. “In 2014 elections in which Naidu won by a slender margin of 1% votes, he did not complain of EVMs. The party which did not do well in the recent state elections in Rajasthan, Madhya Pradesh and Chhattisgarh also did not complain about EVMs. But what this man is trying to do is to take cover on one pretext or the other after the poll debacle,” he said. Jagan, however, lodged a complaint with EC alleging that Naidu government had indulged in large scale irregularities in the voters list and gross misuse of official machinery. He sought immediate remedial steps to ensure a free and fair election in Andhra Pradesh. He alleged that over 59.18 lakh ineligible voters were included in the list of which 20 lakh people have double votes in Telangana and Andhra Pradesh while the remaining 20 lakh have double votes within the state. While this exercise was done to swell their votes, they have taken up enumeration process in the name of various surveys to identify YSRCP sympathisers and are deleting their names to double up the effect, he said. Previous articleVasundhara to replace Balakrishna in Hindupur?